I don’t know I haven’t reviewed this already. I picked a while ago, and it’s just one of those things that you don’t really pay attention to, you just use it when you need it and then forget about it until next time. This teeny-tiny blue plastic bottle with white plastic lid contains 10ml of what to me is liquid platinum. There are soooo many spot treatments out there that aim to target and treat that odd spot, but so many times I’ve been disappointed, by them either drying the surrounding area of skin up causing dead cells to block more pores causing more spots, or they just don’t do a thing. I was recommended this before I purchased it by a couple of people, and in all honesty, I’d never really known much about Origins or paid them much attention as like most men in a shop, I need something to literally smack me in the face before I pay it much attention and you don’t tend to see them doing a lot of advertising, which tells me that they do well by word of mouth and if that’s the case, then it must be because their products work. Well this certainly works, better than I’ve ever seen before, ever! 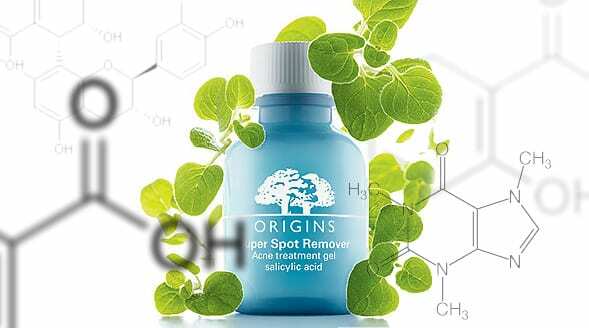 Its feature ingredient is Salicylic acid which breaks down the dead skin that’s creating the blockage, allowing oxygen back into the pore, killing the p.Acne bacteria on sight. As well as Salicylic acid to treat the infection, it also contains calming cucumber and apple extracts that sooth the irritation as well as red algae and caffeine to reduce redness. The reason I write this now, even though this is not a new product to the market or to me, but yesterday evening, I found this painful spot on my forehead that as soon as I noticed it, seemed to balloon instantly. Not taking my own advice, I popped it (gross I’m sorry), and as soon as I’d done that, I placed a tiny finger end’s worth of gel onto it. Today, there is no sign that there was even a blemish there at all; no redness, no inflammation and no repeat infection, it’s well and truly vanished. When you apply it to the skin, it does feel tingly and cool, but not at all like it’s burning or causing irritation, which can be a bit of a drawback. This little blue bottle (it’s seriously tiny) lasts for an eternity, it just never seems to get empty, mainly because you don’t need to lather it on, just a tiny little dab. This article first appeared on MANFACE written by Thom Watson. It was published on Thursday 26th April 2012 and was last updated on Monday 3rd April 2017 at 4:22pm. It's categorised under Acne, spots & blemishes, Enlarged / Blocked Pores, Origins, Special Care where you'll find more related content.